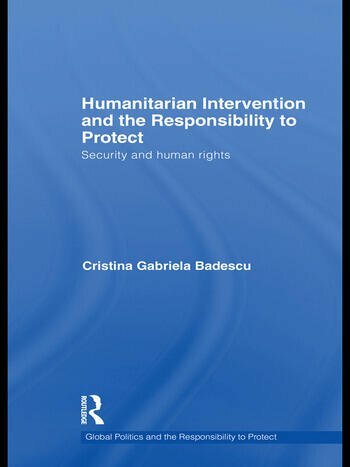 This book explores attempts to develop a more acceptable account of the principles and mechanisms associated with humanitarian intervention, which has become known as the ‘Responsibility to Protect’ (R2P). Cases of genocide and mass violence have raised endless debates about the theory and practice of humanitarian intervention to save innocent lives. Since the humanitarian tragedies in Rwanda, Burundi, Bosnia, Kosovo and elsewhere, states have begun advocating a right to undertake interventions to stop mass violations of human rights from occurring. Their central concern rests with whether the UN’s current regulations on the use of force meet the challenges of the post-Cold War world, and in particular the demands of addressing humanitarian emergencies. International actors tend to agree that killing civilians as a necessary part of state formation is no longer acceptable, nor is standing by idly in the face of massive violations of human rights. And yet, respect for the sovereign rights of states remains central among the ordering principles of the international community. How can populations affected by egregious human rights violations be protected? How can the legal constraints on the use of force and respect for state sovereignty be reconciled with the international community’s willingness and readiness to take action in such instances? And more importantly, how can protection be offered when the Security Council, which is responsible for authorizing the use of force when threats to international peace and security occur, is paralyzed? The author addresses these issues, arguing that R2P is the best framework available at present to move the humanitarian intervention debate forward. Cristina Gabriela Badescu teaches peace and conflict studies at the University of Toronto, Canada. Her research interests include international relations, human security, transitional justice, and the responsibility to protect.